Below are details and links to a selection of writings about silence by Dr Alison Woolley, Director of Seeds of Silence. ​Some are based on her PhD research, whilst others appeared in popular Christian media, such as The Church Times or Retreats 2017, published by The Retreat Association. ​This book discusses Alison's research findings about the role, value and impact of chose practices of silence in the faith lives of contemporary Christian women. Based in her in-depth interviews with 20 women in the UK, conducted as part of her theology PhD, it explores how their engagement in silence-based prayer brings about transformation in the women's relationships with God, with themselves and with others. For the book description click the link or see the shorter version lower down this page. ​Click the image to read the 'Back Page Interview' with Alison in The Church Times from the beginning of Lent in March, 2017. Click the image to read a pdf version of Alison's article, Exploring Silence, written for The Retreat Association's 2017 Handbook, below. The Retreats 2017 Handbook contains 11 further articles and information about over 230 retreat locations in the UK and beyond. To order a copy of Retreats 2017, and to explore The Retreat Association website, click on the handbook image. 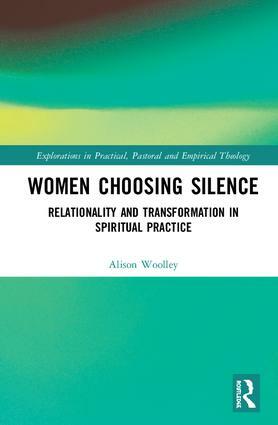 ​This book contains Alison's chapter based on her PhD research into the role, value and impact of chosen practices of silence in contemporary Christian women's spiritual journeys. Alison Woolley, 'Silent Gifts: An Exploration of Relationality in Contemporary Christian Women's Chosen Practices of Silence', in Nicola Slee, Fran Porter and Anne Phillips, eds., The Faith of Women and Girls: Qualitative Research Perspectives (Farnham: Ashgate, 2013), 147-159. This book contains Alison's chapter about silences in research interviews. However, its focus on exploring how new self-knowledge emerges when silence is fostered in one-to-one relationships makes valuable reading for those involved in Spiritual Accompaniment and pastoral care. Based on the methodology she evolved for her PhD research, the chapter interrogates the importance of paying attention to periods of silence throughout all stages of the research process. 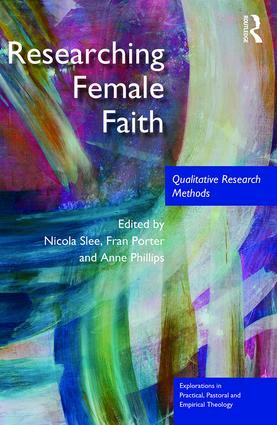 See Alison Woolley, 'Wholly Sound: A Feminist Reframing of the 'Problem' of Interview Silence as a Methodology for Discovering New Knowledge', in Nicola Slee, Fran Porter and Anne Phillips, eds., Researching Female Faith: Qualitative Research Methods, (London: Routledge, 2017), 155-170. Women Choosing Silence: Relationality and Transformation in Spiritual Practice, (London: Routledge, Jan 2019). This book offers readers a detailed account of Alison's research into the role, value and impact of chosen practices of silence in the faith lives of contemporary Christian women. Including many accounts of women's descriptions of their engagement in practices of silence, and the ways that it transforms their relationship with God, with themselves and with others, it presents a moving portrayal of the impact of this ancient Christian spiritual discipline in women's lives today. Silence is long-established as a spiritual discipline amongst people of faith. However, its examination tends to focus on depictions within texts emerging from religious life and the development of its practices. In contrast, this book investigates chosen practices of silence in the lives of Christian women today, evidencing its potential for enabling profound relationality and empowerment within their spiritual journeys. Opening with an exploration of Christianity’s reclamation of practices silence in the twentieth century, its substantive theological and empirical exploration of women’s practices of silence demonstrates that, for some, silence-based prayer is a valued space for encounter and transformation in relationships with God, with themselves and with others. It urges practical and feminist theologians to re-examine silence’s potential for facilitating the development of more authentic and responsible relationality within people’s lives. This unique study provides new perspectives on practices of silence within Christianity, particularly amongst women. It will, therefore, be of significant interest to academics, practitioners and students in theology and religious studies with a focus on contemporary religion, spirituality, feminism, gender and research methods.